So we completed our first BC Tech Club online ad campaign last month. It’s a bit late, but I’d like to share with you the results of our little experiment. As I detailed in my blog post of one month ago (link) we dipped our collective techy toe in to the digital waters with a series of Facebook ads with a goal of driving traffic to the Hire An Eagle page of the BC Tech Club website. To recap, below are the three ads we ran from October 8th, to November 8th. In total, between all three ads, we received 50 click-throughs to the Hire An Eagle page, and generated 2,144 impressions, as well as a paltry 9 likes to the BC Grad Club FB page as a result of seeing the ad. In other words, while only a handful of people may have visited the website, 2,144 unique pairs of eyeballs saw one of the three ads. Facebook counts impressions not just from our target audience segment, but also from target audience members’ extended web of connections. So when someone in our target segment likes our ad, that like makes the ad visible to all of that person’s friend via the news feed, dependant of course on varying news feed settings. We thought it would be fun to experiment with Facebook’s A/B testing feature by offering all three ads with the same copy, same target audiences, and testing three different ad images. It was our postulation that the ad with the photo of Gasson Hall would be the most successful of the three. Since we were targeting specifically Boston College alums, it stands to reason that (hopefully) positive memories and associations of would draw them like a magnet to click on that picture. We discovered however, that we’re terrible at prediction. The most popular ad by far was the group photo ad, with 22 clicks and 1,734 impressions. It’s impossible to say for sure why this picture piqued the most interest among our target. My best guess is that the photo shows individuals clearly working in a business setting which best matches the subject matter of the ad. The Gasson photo on the other hand, while it might make alumni swell with Eagle pride, does not in any way reference recruitment or business. So the Gasson photo might not stand out amongst the other BC-related FB ads that our alumni audience is probably seeing. And with these lessons being learned, we’re ready to launch another Digital Marketing Experiment. For the month of January we are going to turn our ordinary ol’ BC Tech Club Twitter account into a PROMOTED Twitter account! The way it works is simple, we set the parameters for the segment of Twitter users that we want to target. These individuals then will see “BC Grad Tech Club” appear under the “Who To Follow” section on their homepage, and our account will show up higher in related searches. 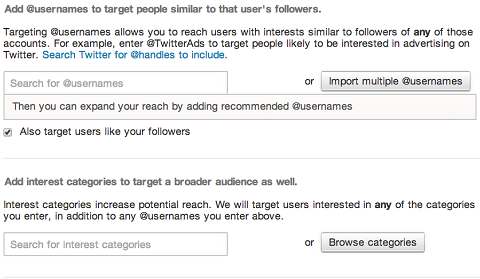 The targeting options for promoted accounts are relatively limited, presumably to ensure clients maintain a broad reach. We can segment by targeting twitter-users similar to a specific account’s followers, for example we might want users similar to those who follow @TechCrunch. We can also segment by interest category, and within the Technology & Computing category there are plenty of interests to choose from. And that’s basically it. It’s a very straightforward service to use, and clients are only charged per new follower so we are paying explicitly for desired outcomes, rather than for less meaningful interactions. The goal here is audience building; we want to enhance discovery of the BC Grad Tech club among those individuals who would be interested in learning about our activities at Boston College, and who might want to hear what we have to say. We want to increase overall engagement with our Twitter account and increase our followers. Every new twitter follower is a new touchpoint for the BC Grad Tech Club, and a new potential networking contact for all our members.